By the 1870s, lumber baron Walter Scott Hobart had established operations for the Sierra Nevada Wood & Lumber Company at Sand Harbor. 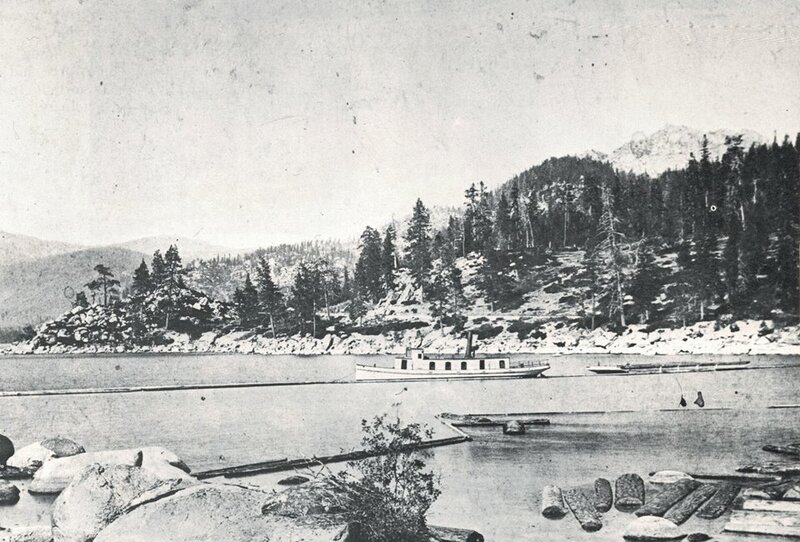 Trees logged around the lake were towed into the harbor behind the Steamship Niagara and then sent by rail to the company sawmill in Incline. From there, milled lumber and cordwood was taken to the Comstock Mining District by the ingenious Great Incline Tramway of 1880, and an intricate system of V-flumes. Following the death of his father in 1892, Walter Scott Hobart Jr. inherited his family's wealth and land holdings. He exhausted much of his acquired fortune on a lavish summer resort along the shores of Sand Harbor and entertained the social elite aboard his yacht, the Quic Chakidn. In the early 1920s, Hobart leased the master cottage at Sand Harbor to Frank W. Fuller, Vice President of the W.P. Fuller & Company paint firm. His son, Frank Jr., and family continued to enjoy summers at the harbor until 1966. Fuller Jr. had a passion for flying and moored his Gruman Goose seaplane, and later his Gruman Mallard seaplane, on the shores of Sand Harbor. Boaters enjoyed the spectacle of watching Fuller's planes lift gracefully out of the water and rise above the lake. Born to one of San Francisco's wealthiest families, George Whittell Jr. lived off the millions inherited from his parents. He avoided the 1929 stock market crisis (and some believe contributed to it), by liquidating $50 million in stock holdings just months before the crash. George moved his fortune to Nevada, and during the early 1930s, he purchased most of the east side of Lake Tahoe. His land holdings included Sand Harbor (purchased from Hobart Jr.), where he planned to build a casino. Between 1936 and 1939, Whittell focused on the construction of his own magnificent summer estate, the Thunderbird Lodge. This also became home to his famous yacht, Thunderbird, and a variety of big game animals. The historic estate is visible to the south of Sand Harbor, and beach visitors can still catch a glimpse of the Thunderbird yacht cruising by on warm summer evenings. As the years passed, George grew more reclusive, gradually abandoning his development plans for Tahoe's east shore in favor of maintaining his own private hideaway. During the 1950s, the State of Nevada began negotiations with Whittell to purchase land along the east shore of Lake Tahoe for a state park. In 1958, Whittell reluctantly agreed to lease a portion of Sand Harbor beach to the State of Nevada for public use. A decade later, judicial action forced him to sell 5,300 acres which became the foundation for Lake Tahoe Nevada State Park. Grand opening ceremonies were held in 1971, and now, early in the 21st century, more than one million visitors enjoy the park annually.